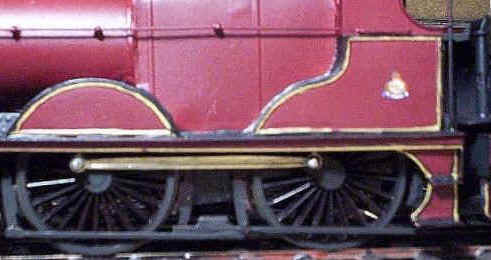 Lining Midland Railway models can be tricky. In order to speed up the process, and keep it within my personal level of competence and commitment, I've developed a very simple method which gives, I feel, acceptable standards of appearance at normal viewing distances on the layout. The method used is very simple. 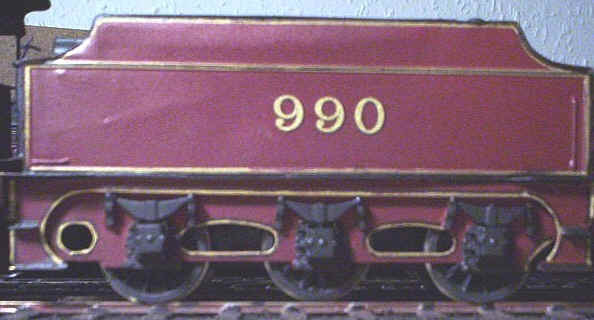 After the crimson lake maroon has been applied, and the paint allowed to dry for at least 24 hours, I originally used a gold marker pen I obtained from W. H. Smith stationery department. However, the specification of these has now been altered so I've started to use one made by a firm called Pilot and obtained mine from Stationery Box (Pilot's website is at http://www.pilotpen.com.sg/index.html). If the lining is for a straight line, I simply draw a line using a ruler. For curves I apply the line freehand. At this stage I don't worry if a little of the gold paint runs off the raised beading, as I'll touch up later on. I leave the gold to dry for another 24 hours (although it is often possible to go to the next stage sooner if required). The next stage is to use an overhead projector pen to draw the black line down the centre of the gold line, effectively creating a gold/ black/ black line. The pen I use is a Staedtler permament Lumocolor pen. The thickness I use is labelled S - for small I presume - and is often available in packs of four different colours under the code no.313, which is marked on the pens. The number on the pen I have at the moment is 313-9. Once again I use a ruler to apply the straight black line and apply curves freehand. If the line slips from the centre of the gold, simply reapply the gold and try again. When you're satisfied touch up any excess gold paint, which has strayed onto the crimson lake maroon, with a fine brush. After this has dried, and any transfers applied, I spray the model with Railmatch satin varnish to complete the job. Obviously, the results I obtain are relatively crude, and the gold paint isn't quite the same as the creamy straw paint used by the Midland, but on the whole I'm reasonably satisfied. I doubt I would have attempted to model the Midland without discovering this technique. I used it some years ago on 7mm Midland coaches with equal success.